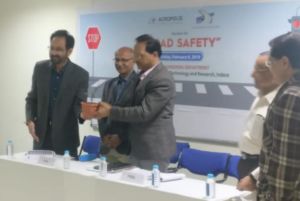 In series of the National Road Safety week from 4th Feb 2019 to 10th Feb 2019, Department of Civil Engineering has organized a Seminar on “Road Safety” by Er. Ravindra Gupta, P.D. NHAI, Er. Ajay Pandey, M/S Indore-Dewas Tollways, Er. 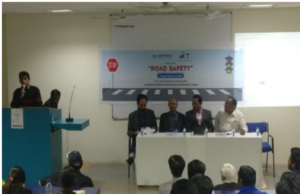 P C Agrawal, Ex Chief Engineer, MP PWD with the aim to run road safety educational information, awareness for the effectiveness of road safety education & to promote the voluntary compliance with traffic legislation. Expert panelist/delegates were invited to address to the challenges and problems with road safety issues & its measures. Lots of discussion and knowledge sharing was done to aware students and masses about the same. It was indeed a knowledgeable and very interactive session where students as well as faculty members of civil engineering interacted and suggested their opinions before the panelist. Dr. S C Sharma, Director AITR graced the occasion and Prof. S K Sohani, Head Civil Engg. welcomed the panelist/delegates. ‘Welcome Note’ has been givenby Dr. S. K. Sohani and ‘Vote Of Thanks’ has been proposed by Mr. Jayant Awasthy.